Despite being perched on the Cascadia Subduction Zone, the Pacific Northwest is unprepared for a large earthquake. Our goal is to test the effectiveness of various messaging strategies and design a multimedia campaign that motivates disaster preparation in diverse audiences. We created four short videos depicting an earthquake in Portland. We varied them across 1) gain or loss outcome framing and 2) male or female narrator identity. We measured participants’ physiological responses during media viewing. Participants then completed a survey about video content, character identification, previous earthquake knowledge, and intended actions regarding earthquake preparation. Across all conditions, participants reported a significant increase in their intent to prepare for earthquakes. However, participants who were older, more knowledgeable, and more prepared chose an emergency tool over monetary compensation. Participants who were less prepared more frequently opted to browse an earthquake-readiness website. 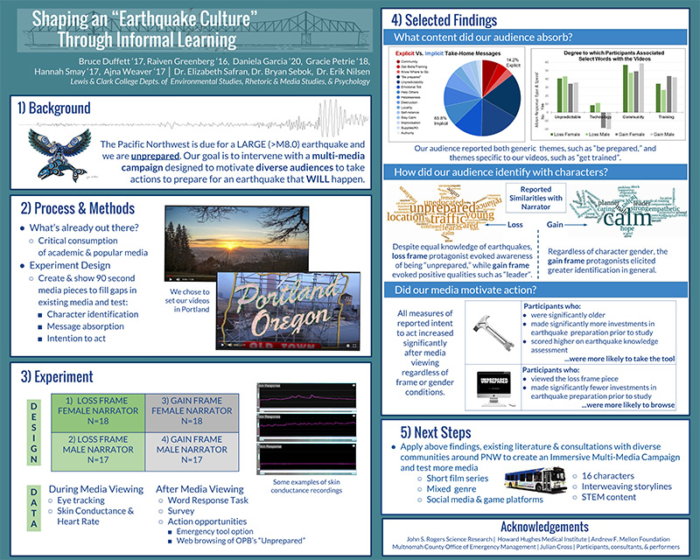 Despite equal knowledge of earthquakes among viewers, the loss frame narrative evoked awareness of unpreparedness while the gain frame evoked self-identification of positive qualities. Regardless of character gender, the gain frame protagonists elicited greater identification in general. Participants reported messages from pre-existing disaster campaigns alongside specific messages contained in our videos. We are currently integrating our findings into an immersive campaign that spans genres and fills gaps in existing messaging.